Cozy Chicks: MAKING NEW YEAR'S RESOLUTIONS? THINK AGAIN. MAKING NEW YEAR'S RESOLUTIONS? THINK AGAIN. Did you know that making New Year's resolutions can be hazardous to your health? (Your mental health, that is.). It can lead to doubt, guilt and discouragement. Think of all the resolutions you've made (and broken) over the years. Most resolutions bite the dust by mid-January. I have another idea that you might like to try. 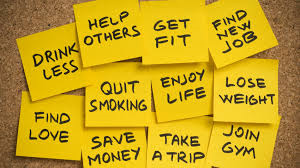 Instead of making "resolutions," choose six "habits" that you'd like to incorporate into your life. Six sounds like a lot but the beauty of this plan is that you don't have to tackle all six at once. They are sequential. You add one each week until you have accumulated (and hopefully mastered) all six. One of my clients came up with this plan to help her control her weight and to "eat healthy" throughout the coming year. She did a lot of research and chose six "must have" habits that combined food choices with behavioral techniques to guide her on her way. Here's her plan; you might want to use it as a guide for your own journey. Week One: Night eating. "The kitchen is closed at seven o'clock every night. I keep myself so busy all evening, I don't even think about snacking." One of her main problems was "night eating," and she knew she had to come up with an alternative plan. So she enlisted the help of a neighbor (always good to have a buddy system) and in nice weather, they go for a walk every evening at 7:00 pm sharp. In cold weather, she walks on her treadmill and treats herself to an episode of her favorite crime show on TV. Week Two. No snacking between meals. This is a tough habit to break. She conquered "mindless snacking," by incorporating two healthy snacks into her new eating plan. Home-made salsa on a rice cake, maybe a few nuts and a handful of grapes and she's satisfied. Just google "healthy snacks under 100 calories" and you'll get loads of ideas. In winter, a cup of hot soup is also a good choice, it's comforting and filling. Studies show that people who have a cup of soup mid-morning, eat fewer calories at lunch. And if they have the soup mid-afternoon, they eat less at dinner time. A win-win! Week Three. No more sugar. This was a tough week for her because she was determined to eliminate "processed" sugar from her diet. Did you know sugar seems to be in everything? And it's highly addictive. Books have been written on "sugar cravings," and "sugar highs." She managed to conquer her sugar cravings by sugarless gum and fresh fruit. A couple of slices of fresh cantaloupe can be delectable and satisfying. Add a few strawberries and top it with a big spoonful of plain (not sugary) Greek yogurt. The jury is still out on "diet drinks" so it's probably best not to indulge if you're trying to eat healthy. And she eliminated all "bad" carbs that go right to sugar in your body (cakes, pies, pastries, etc). HALF WAY THROUGH! And time to evaluate. 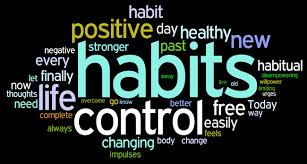 She looked back over the first three weeks and realized that she had managed to maintain all three "new habits." But the mid-point of any program is always dicey and it's easy to slip back into old ways. Week Four Drink 9-10 glasses of water a day. This became her mantra. She gave up all sodas, all fruit juices and all forms of alcohol. 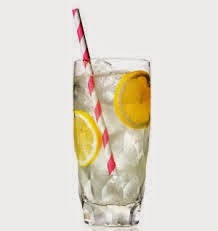 Her "new" drink is club soda with a twist of lemon or lime and she treated herself to one of those gadgets that lets you make club soda at home. She says she has no desire to go back to her diet sodas, and doesn't miss them a bit. Week Five. Write it down. Ah, the power of the pen. She kept a food diary as a way of "accountability" and "keeping on track." She could look over the diary at the end of every week and see if she had managed to keep up these new "habits." Happily, she had. Week Six. Slow down and really focus on your food. But if you do that, won't you eat more? No, you'll eat less. It takes 20 minutes for your brain to realize that you've eaten and to quell those hunger. People who eat in a hurry tend to eat more, not less, and they're careless about their food choices. So slow down and enjoy every morsel. I hope you find this idea helpful and ditch your New Year's resolutions for 2015! Good luck and Happy New Year. It's always a good idea to try to make changes gradually. I'm glad her process worked for her. Years ago when I was trying to lose some weight I tried something that worked really well for me, and I still try to do it whenever I can (although I no longer "diet"). I remembered hearing about it taking your brain 20 minutes to registered that you have eaten, so I try to eat something (fruit, small salad, etc.) about a 1/2 hour before a meal and then I don't eat as much at that meal. I really hate when I eat a big meal and then about 20-30 minutes later I realize I had eaten way too much and I feel awful. That practice helps solve the over eating issue. Of course, I'm not always able to eat ahead of a meal, but when I can, it does help. 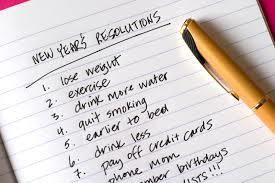 I don't make resolutions, but I do have a tendency to want to make some changes when a new year rolls around. This year I want to do a MAJOR sweep of my house and get rid of clutter. I have had so little time the last couple of years that I let my house get so cluttered and disorganized that it is stressing me out because I can't find anything when I need it. So I made a list of the things that I want to accomplish, and I'm trying to concentrate on the things that are most important to me first. But my list has another purpose. When I have just a little time, I look at my list and pick something that is quick to do. It may not be at the top of my list, but at last I'm crossing something off rather than doing nothing. I like this. I can't even say the word diet without my body and mind revolting. Hi Lynn, glad you like this idea, thanks for stopping by! Lynda, those are both great ideas! I just read an article on clutter and it suggested de-cluttering by "item" instead of going room to room. For example, first tackling all the paper clutter, then clothing, etc etc. Thanks so much for stopping by and good luck with your new fosters! This is a brilliant post, Mary! Thanks so much. I do think we set ourselves up for failure with resolutions. One at a time seems like a great way to outfox our minds. Hi MJ, so glad you like it, thanks so much for stopping by! I'm thinking you're probably burning off lots of calories just buy surviving a Canadian winter. I've actually been doing that. I started with the papers. I had cleared out an old storage shed and brought home 30 boxes of paper (mine and my parents) - Yes, 30!! Some dated back to the 70's. I recycled about 15 boxes, I have about 10 to be shredded and 5 that I need to file or keep for awhile (although this time I labeled them with the date they can be destroyed). Then I hit the closets, drawers and storage boxes and donated about 3/4 of what was there. I had a lot of clothes that I used to wear for work that I will never wear again. I also had a few things that I loved but will never again fit into. Right now I'm going through all my Christmas decorations and downsizing those as well before I put them away. It really does feel good to de-clutter, but in the past it had been difficult for me. But not being able to find things when I want them has totally stressed me out lately, so I'm in the mood to get rid of stuff. I hope I stay that way long enough to get through everything. OMG< you have been BUSY, Lynda! You give so much time and energy to the fosters and to Lapcats, I don't know how you do anything else. I really admire you! Striving for one new habit only---replacing diet coke with ice green tea or water (I've been drinking 32 OZ of diet coke a day). Just finished Lethal Letters. I live in Seattle now but am from and greatly miss Dixie. I try to read mysteries that take place in the South and was delighted to read about the Charmed Pie Mysteries which take place in my home state! Go Bulldogs, go Falcons, Go Braves!! What brilliant ideas, Mary! This approach also makes perfect sense from the perspective of the law of attraction: you're focusing on the new and the positive, not the negative. On solutions, not problems. Thanks! Nine to ten glasses of water would be a lot to drink! I've read that even doctors don't know where the idea of drinking eight glasses of water came from and that you may not need to drink that much. I wouldn't want to give up drinking pop. I usually drink two cans a day. I love diet cherry cola. I don't drink alcohol. I don't get New Year's resolutions. A new year doesn't really change anything. You could make a new month resolution, if you'd like! Or just say, this week I'll clean up this pile. I do need to declutter, but wouldn't want to get rid of any clothes. I can never find new ones that fit. Great ideas, Mary. I lost almost 15 lbs. by paying more attention to what I ate and keeping portions under control and not being tempted by things that weren't really all that good--like the jelly donuts someone put out at work. I didn't really diet. Of course it took a year, but that's fine. I wasn't in a hurry! That's great, Kim! I feel much better since giving up diet drinks! Thanks for stopping by. HI Michelle, I need to de-clutter, too. It's one of my least favorite things to do, but it has gotten out of hand. I'm starting with "paper clutter" right now and will move on to clothes next. Thanks so much, Leslie! It seems more successful than the old "resolution" route. Hi Lisa, thanks for stopping by. Happy New Year!